The book Ray Gun by Eugene W. Metcalf and Frank Maresca examines the science fiction side of the paleo-future. I tend to stay away from pure science fiction on the Paleo-Future blog but there's no doubt that images of futuristic heroism had a large impact on mainstream ideas of what tomorrow held. 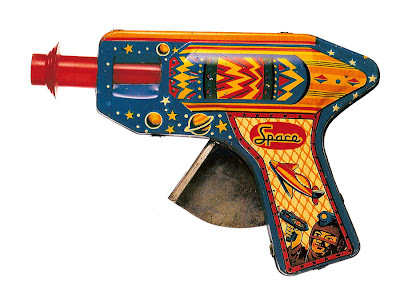 Above is one of the many ray guns featured in the book which were beautifully photographed by Charles Bechtold. This particular gun is from 1950s Japan. 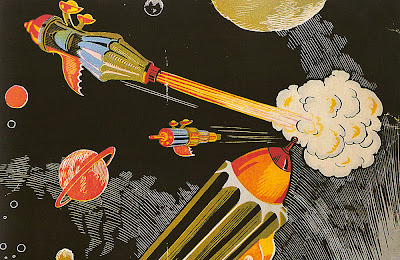 Below is an image from the Buck Rogers Origin Storybook, originally published in 1933.